I hope you had a wonderful weekend. One of the things that happened over the weekend was the first quarterly Diva Day. I rewarded the top demonstrators on our team with an afternoon of stamping. For the demonstrators who weren't able to attend (due to distance or other engagements), I will send them the supplies to create the projects. They each received a package of our mini lunch sacks and all the projects we made were using them. I will share them with you over the course of the week. 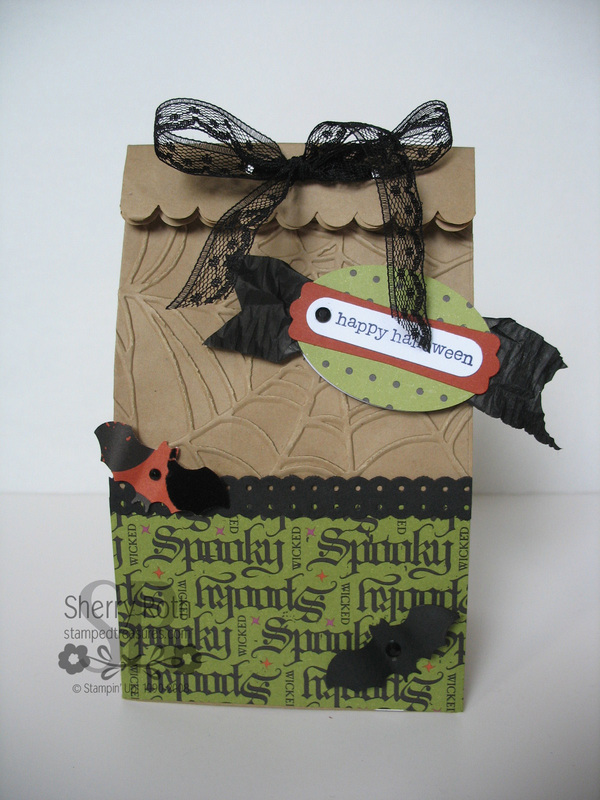 This Halloween goody bag was the first project we made. I've seen several of these on a variety of websites and was inspired to give it a try. I love the way it turned out. I love the texture the Spider Web embossing folder gives the bag. Because it is rather thick you do need to open your multi-purpose platform all the way and be very careful when you open the bag.